Ready to leave for your vacation? 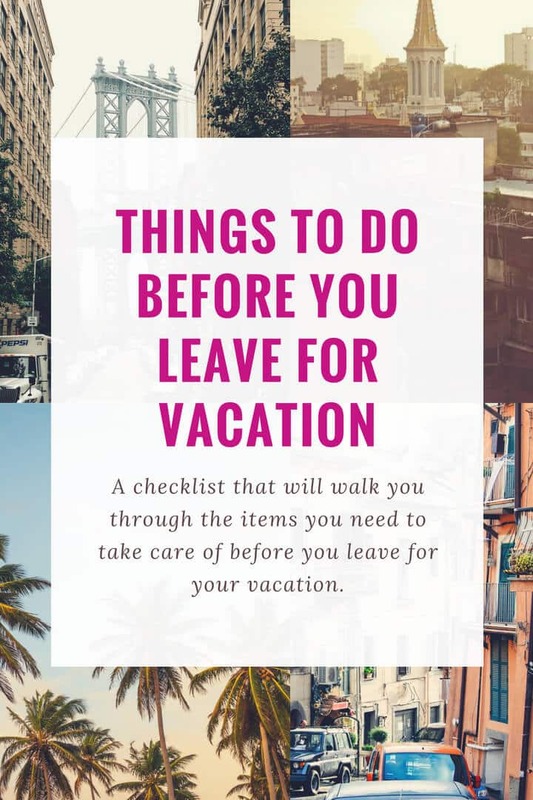 Before you leave, follow this vacation checklist to make sure you have taken care of all essential tasks before you hit the road. Imagine coming back from a fun vacation to a bunch of overdue bills or a stinking refrigerator. 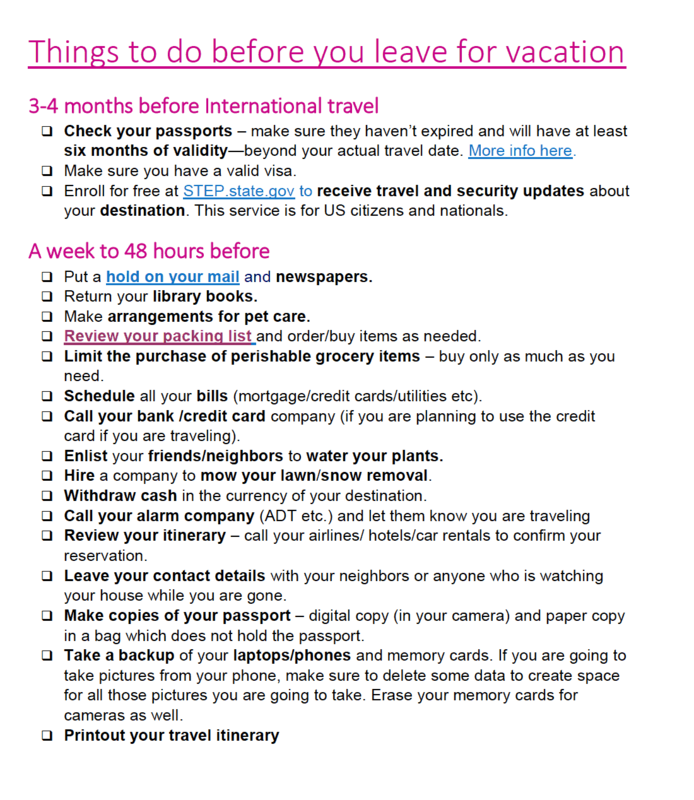 Just like your vacation, your homecoming should be stress-free as well – that’s why I made this checklist of essential tasks to complete before you leave for your vacation. Check your passports – make sure they haven’t expired and will have at least six months of validity—beyond your actual travel date. More info here. Make sure you have a valid visa. Enroll for free at STEP.state.gov to receive travel and security updates about your destination. This service is for US citizens and nationals. Put a hold on your mail and newspapers. Make arrangements for pet care. Review your packing list and order/buy items as needed. Limit the purchase of perishable grocery items – buy only as much as you need. Schedule all your bills (mortgage/credit cards/utilities etc). Call your bank /credit card company (if you are planning to use the credit card if you are traveling). Enlist your friends/neighbors to water your plants. Hire a company to mow your lawn/snow removal. Withdraw cash in the currency of your destination. Review your itinerary – call your airlines/ hotels/car rentals to confirm your reservation. Leave your contact details with your neighbors or anyone who is watching your house while you are gone. Make copies of your passport – digital copy (in your camera) and paper copy in a bag which does not hold the passport. Take a backup of your laptops/phones and memory cards. If you are going to take pictures from your phone, make sure to delete some data to create space for all those pictures you are going to take. Erase your memory cards for cameras as well. Clean your refrigerator – freeze fruits or chop them for your journey. Freeze what you can and discard the rest. Review the travel checklist and make sure all the essentials are packed. Remove any cards (grocery/department store) from your wallet that you won’t need on your trip. Store valuables in a safe place or bank. Fully charge the electronic devices that you are planning to take with you – laptop/mobile/iPad etc. Set your temperature at 50-55 degrees F in the winter to prevent against freezing pipes and to 85-90 degrees F (or even turn it off) in the summer. Take out trash from EVERY room in the house. Don’t forget the bathrooms. Leave a light on or invest in a programmable timer that will turn lights on and off randomly. Unplug small electrical appliances such as toasters, laptops. Check your laundry – make sure there are no wet clothes inside. Close blinds and curtains before you leave. Make sure all the doors/windows are locked. Don’t forget to close your garage door and the door that connects the garage to your house. Activate your alarm before you leave. Turn off your main water supply to prevent any leaks when you are gone. Pour baking soda and vinegar down your drain – your toilet won’t stink from stagnant water when you come back from a long vacation. You are all set! Now have a relaxing time and enjoy your vacation! I freaking loved this list! Thanks for putting this up. I’ll be taping this to the fridge. 🙂 Thanks, Tina for stopping by.